I have been to a few places in Europe and so far my favourites were the capitals of Hungary and Portugal. But now Budapest and Lisbon have to move over, as my new number one is Malta. At the beginning of December P was able to take a few days off and he wanted to go on vacation. We didn’t take any this summer because we both worked a lot, so now was the perfect time for a break. We ended up in Malta mostly because the weather was nice. And because I’ve always wanted to go there. I am interested in languages and history, and there’s much to discover about both on this little group of islands. 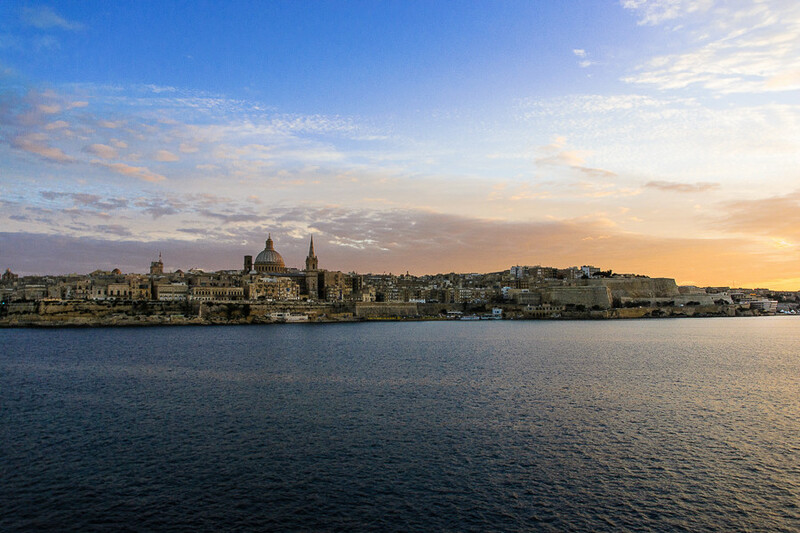 It turned out that Malta wasn’t the easiest destination to get to for us. We took a train from Dresden to Leipzig and stayed in a hotel to get up very early the next morning in order to take a train to the airport. That morning started great with a kid that refused to get up (I completely understand) and an almost missed train. When we arrived in Düsseldorf, we were supposed to pick up and transfer the luggage, but of course we coldn’t find it in time and missed our connection. Thankfully the airline was very accomodating and booked us on a new plain to Valletta via Zurich. We had gotten up at 6 am and finally landed in Valletta at 8 pm where we took three different busses to get to our apartment in Sliema, which is a town close to Valletta. In the past I would have been a little bit anoyed about all the delays and the chaos. But if you travel with a three year old child, your only concern is to keep her in a good mood. And I am still amazed by how calm she was. We had taken books with us to read to her, spent a lot of time on carousels and playgrounds at the airports and tried to keep her occupied somehow. It seems that she is the perfectly calm and patient traveller! I think I also hat such a positive experience in Malta because this was the first vacation with our child that truly enjoyed. In March we went to Mallorca and made the mistake not to take a stroller or push car with us. We ended up carrying our child everywhere and that was not very enjoyable. This time we simply put her in the push car and walked while F was sitting in her stroller singing and talking. The next day we tried to explore the island. Malta is the most interesting place I have ever been to, I think. So much has been going on on these islands since the stone ages and so many historic monuments have been preserved on so little space. We made a walk around the coast and finally reached a spot where we had the most fantastic view of Valletta, the capital. This city was once built by crusaders, the Knights of St. John. 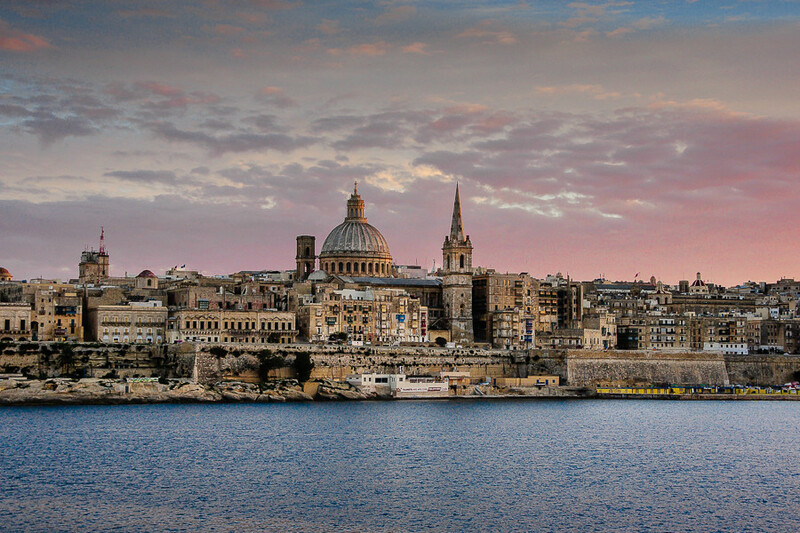 They made Valletta into a fortress and ruled it until Napoleon drew them out. It’s very easy to get around in Malta. The public transport by bus is slow, but very good and cheap and you can reach every destination by travelling this way. 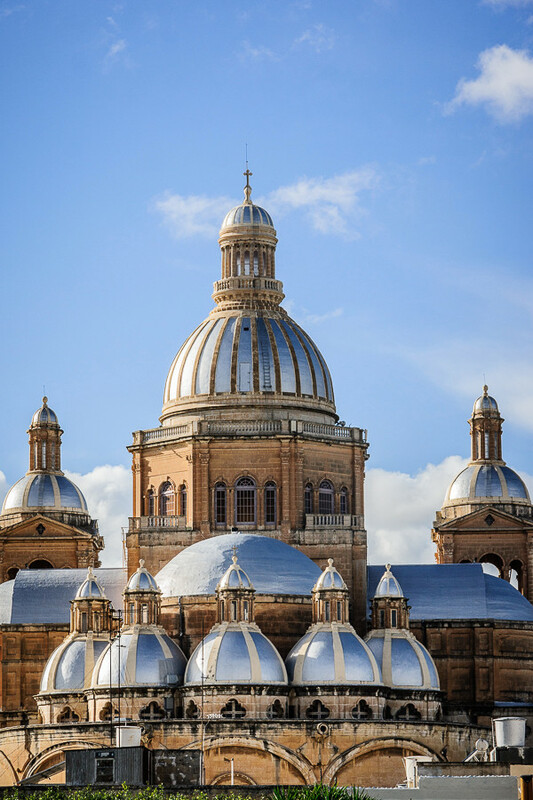 There are also a couple of ferries and cruises which will take you to Valletta or the second biggest island Gozo. The islands are small but highly populated and urban. Every person speaks both Maltese and English so you will have no problems getting around. We took the ferry from Sliema to Valletta, which was much faster than the bus and only took ten minutes. We walked around the city to find the St. John’s Co-Cathedral, where we wanted to look at two Caravaggio paintings. Unfortunately it was a public holiday and the church was closed in between services. 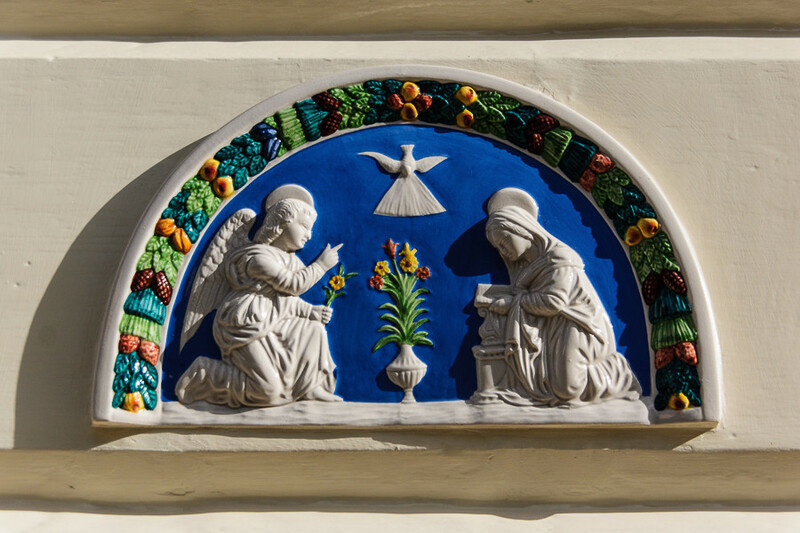 Malta has a long Catholic history and you can see the big role the church and the Catholic belief play or have played here on every street corner. 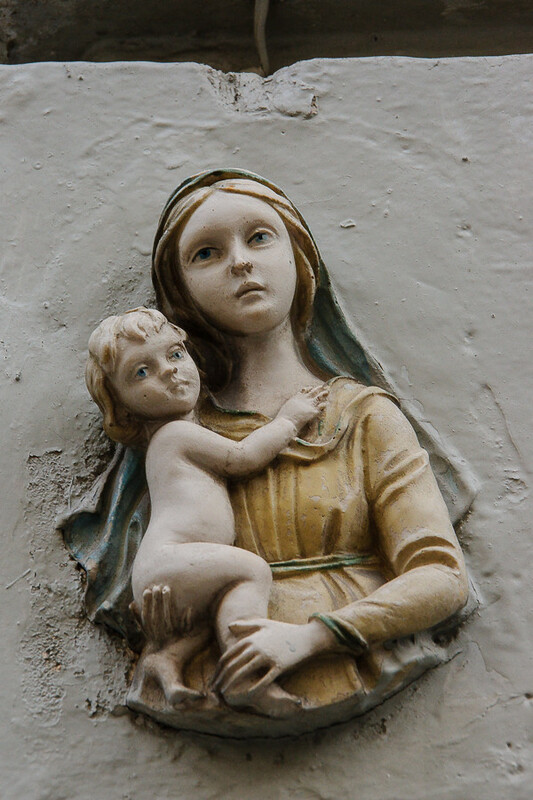 Houses are often decorated with little sculptures and tiles that picture prominent Catholic characters. The churches in Malta are quite impressive. One day after a walk through Ħal Tarxien and Paola (Raħal Ġdid), two places famous for prehistoric temples, this huge parish church popped out of nowhere. The light building with the shiny roofs was very beautiful to look at with the blue sky and the sea in the background. 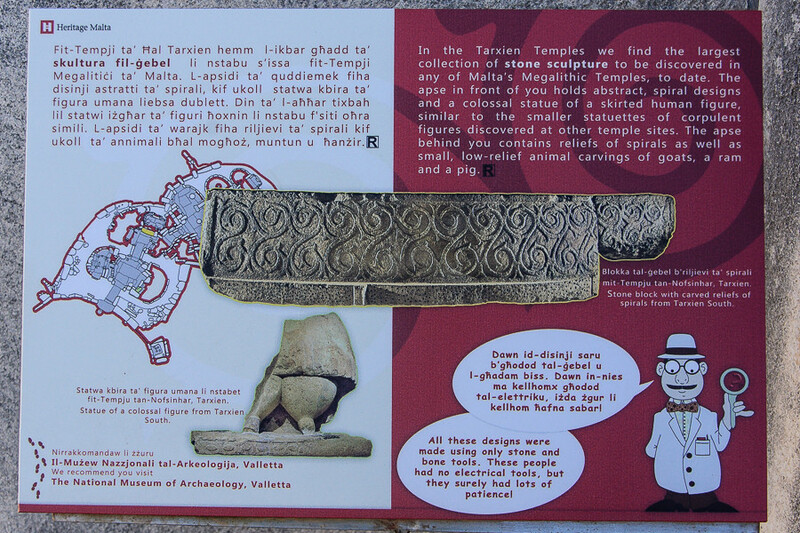 In Ħal Tarxien we visited the Megalithic temples. We have lots of old sites in the area where I grew up, but I have never seen anything nearly as striking as these ruins. Malta is a very small country and it’s kind of isolated from other countries because it’s an island group. You cannot just get there by simply walking over an European border. I come from a large country with several big cities, a very long history, and nine neighbour countries which all are part of our history somehow. Much of that history sometimes gets lost because there is an infinite number of pieces you have to put together and they are all over the place. There are so many places, so many people, so many events. Of course Malta’s history is like that, too. Especially since it has been occupied so many times due to geostrategic reasons. 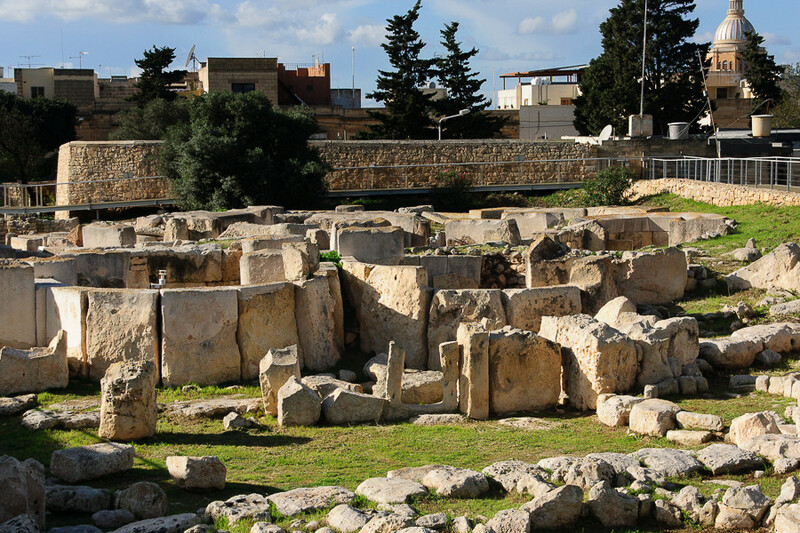 These occupations are a big part of the Maltese culture: the first official language derived from an Arabic dialect, influenced by Italian and written in Latin. The second official language and the left-hand traffic brought by the British. The Catholic church and belief brought by the Maltese knights, and so on. But Malta is also small. On this tiny island group with very small distances and a very urban infrastructure, you can find history everywhere and you can put together the bits and pieces yourself without travelling far. 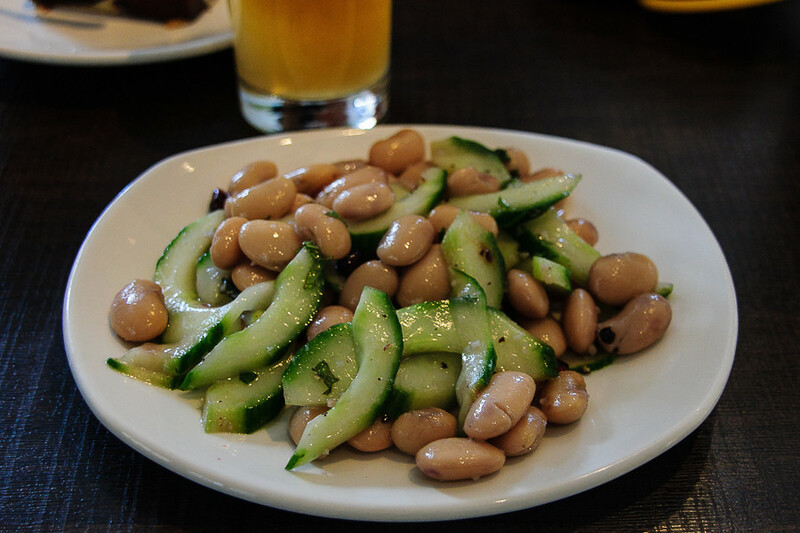 Mint is another option for vegan food in Sliema. They have a counter where all the food is displayed so I wasn’t sure if it’s an option to get something customised. They usually close already at 4 pm, so we decided to go there for breakfast. 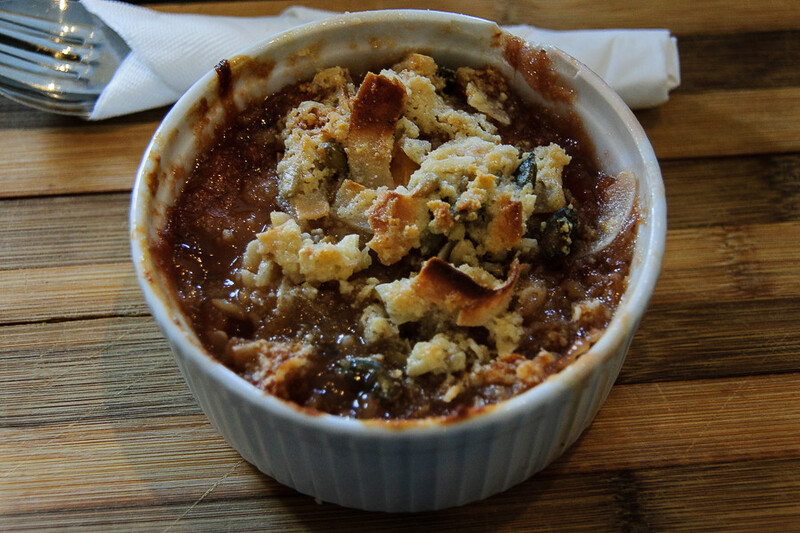 The vegan items were limited to lasagna, a bean salad, and a rhubarb ginger crumble (vegan without ice cream). Since I am not a very big breakfast eater I chose a small serving of bean salad and the crumble. 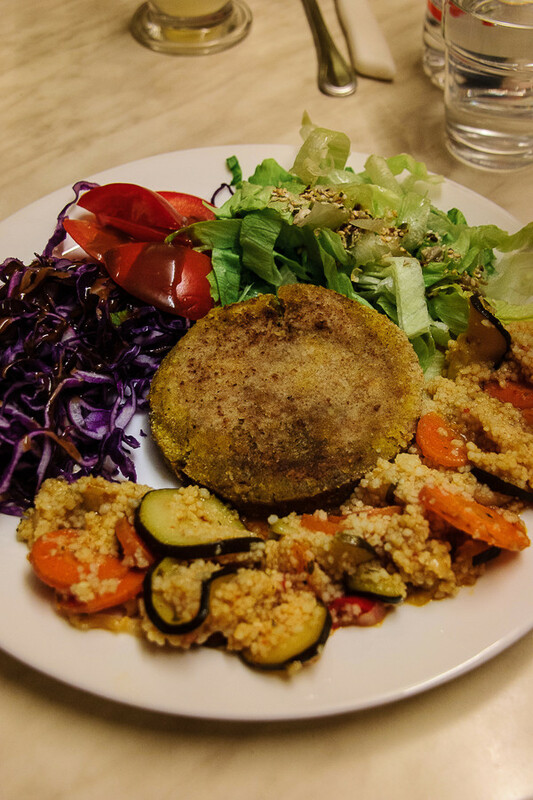 The salad was nothing special but the crumble was very good! In Valletta we had lunch at Soul Food, which is a very small Italian restaurant in the centre of the capital and the have several vegan and vegetarian options. I had a burger patty with some side dishes. You can choose what kind of patty you want and I went with the chickpea variety, which was very dry, unfortunately. We ate out only on these few occasions, most of the time we cooked food in our apartment. The supermarkets carry lots of fresh vegetables, you can get all kinds of pulses, plant based milks and Alpro soy yoghurt, fresh bread, hummus, and other spreads and so on. Many foods are imported from the UK, Germany, Austria, or Italy and the supermarket frequency is not very high. You can find many small grocery stores though which are open on public holidays and weekends. 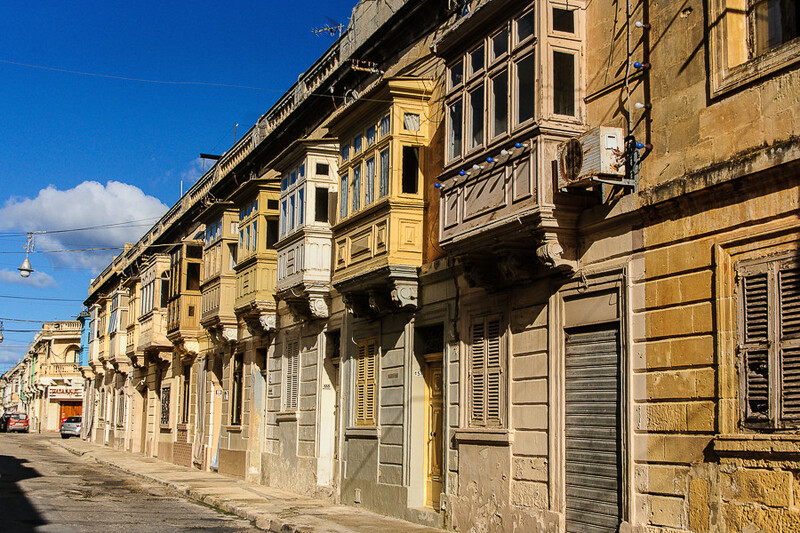 Malta has several markets where you can buy fresh food, too. We had fresh bread for breakfast every morning and I topped it with jam, hummus or bigilla, which is a vegan bean spread available all over the islands. 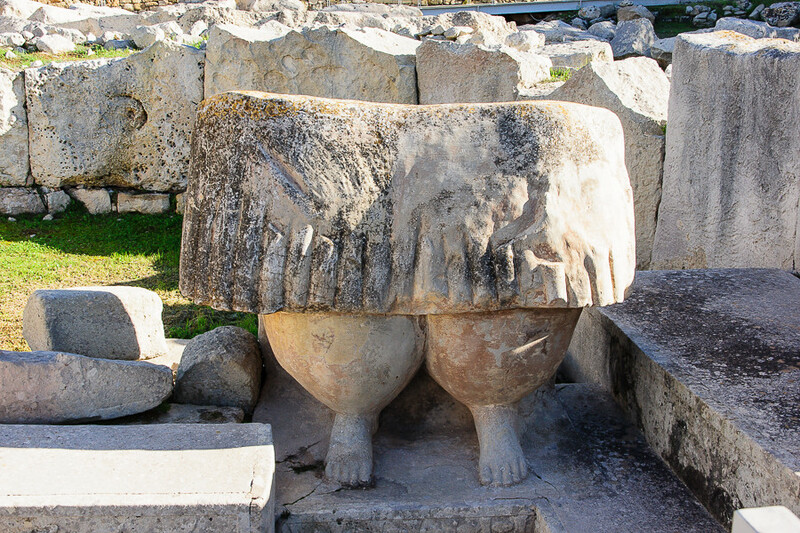 Malta is a very beautiful country with lots of interesting places to visit, it’s easy to get around and you can see a lot even with a toddler, because distances are short. We’ve enjoyed simply walking trough streets or around the coast all days long. Of course we had to explore playgrounds with F, too. There were plenty, especially along the coast. Temperatures in December were always around 18°-20°C and even though it’s one of the rainiest months, we only had one rainy day. It was really hard to leave and I am already dreaming of going back! Vienna, Part Two & Bonus Squirrel! Thank you for sharing this – trying to plan our first holiday since becoming vegetarian, and taking my son and his partner who are vegan. Malta looks lovely and its good to know there are vegan options available. You have given me travel envy! What a lovely trip, and the food looks fantastic. 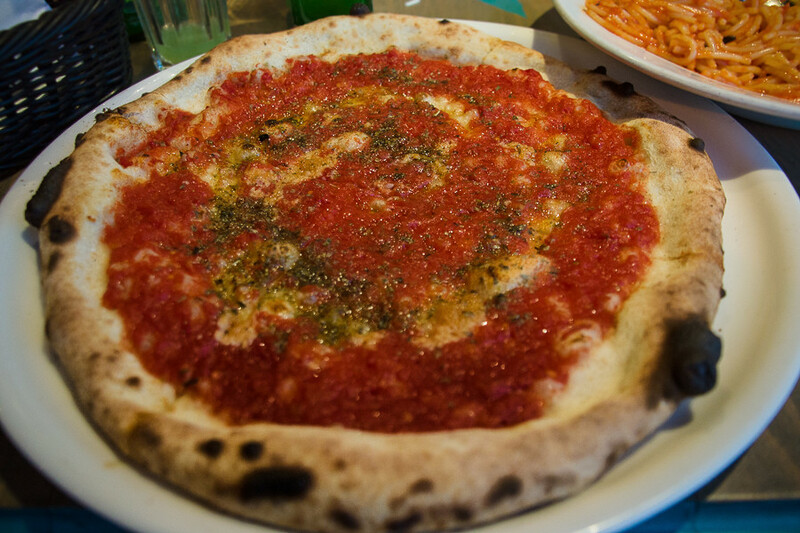 The pizza marinara looks amazing with those charred spots and its simplicity. I love a simple pizza that isn’t loaded down with toppings. I wonder if the green stuff is some sort of pesto or an herby oil? Those were just some dry herbs topped with olive oil. Pesto would have been really nice, too. wow, what a beautiful place. Sounds like you had a great trip despite all the issues with travel. Sounds like a really wonderful trip! I loved looking at all of your pictures and it’s really good to know that getting vegan food was straightforward. I agree with you – enjoying the sights and sounds is my first priority when traveling, good vegan food is just a nice bonus. Happy New Year! Klingt, trotz anfänglicher Tortur, nach einem tollen Urlaub. Gerade die ersten drei Bilder sind beeindruckend. 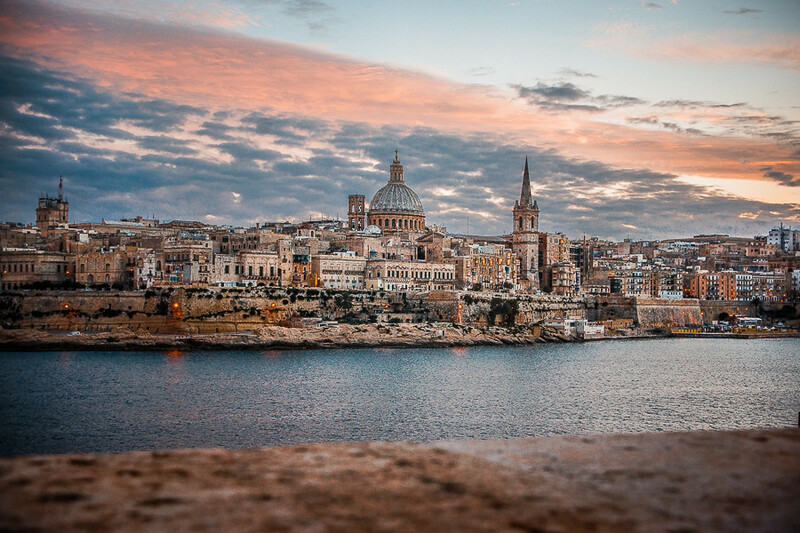 Your pictures are beautiful and I really enjoyed them and reading about Malta! Thanks!